1990 Toyota Celica All Trac Turbo!!! 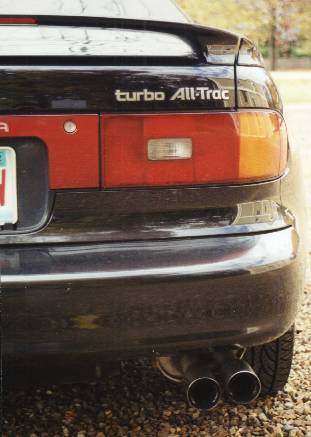 Information and photos about this Alltrac Celica. This is a rare car. There are only a handful in Massachusetts let alone the New England area and you don't see them up for sale too often. Every now and then I'll see one on the road but mostly you see the regular model Celica from these years. This particular model Celica was only imported to the USA from 1990 to 1993. - Leather wrapped steering wheel, Variable-assist power rack-and-pinion steering. - Tires: 215-50-15Z Dunlop SP Sport 5000 All weather. - AC, PS, PB, Cruise… Everything! Cloth seats. - Nonsmoker. never smoked in. - Exterior color black, interior is gray. - Hatchback, more storage room with seats down. The stock rating is 200 horsepower however most cars are not quite at the stated level from the manufactuter. With the addition of the HKS freeflowing air filter and exhaust it's at least that if not more. You feel the difference immediately when pressing the accelerator, it just goes. The Alpine alarm is excellent and will not go off by accident. It can be set so that the alarm is off and pressing the button acts as automatic door lock/unlock. This is useful when leaving the car with valet or mechanic. Once you drive AWD you'll never want to go back. This car has amazing traction in wet weather and snow. You will never get stuck in normal snow conditions. The car fits wider than normal tires which aid in grip and traction. The car has a very balanced feel in handling. It seems centered as opposed to being front or rear balanced which would make it feel like one end or the other might give way on a steep curve. Quite the opposite. Throw it hard into a curve like on a highway exit offramp and it holds and sticks like glue to the road. Click here to learn about the maintenance and why I'll never go back to the mechanics who worked on the car.